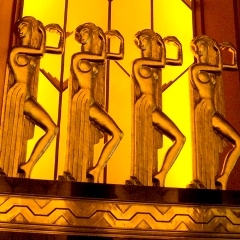 What do Art Deco and Archaeology have in common? Quite a bit, if you look at enough Art Deco architecture. In 1922 Howard Carter entered into the tomb of the young pharaoh Tutankhamun and discovered riches beyond his dreams. For several years the world shocked, entertained, and delighted by the riches photographed, cataloged, and put on display. Interest in Egypt was nothing new. There were plenty of ruins above ground, so that the basic forms of Egyptian design and culture were well known, but King Tut, at 3300 years old, became an overnight celebrity. No tomb before had born such glorious treasures with which to amaze the world. 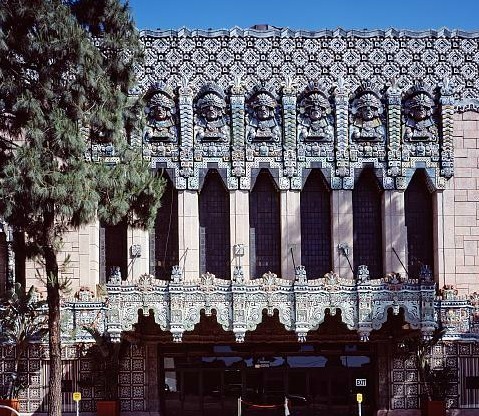 While the Ejido theater may have gone for a literal interpretation of Egyptian art, the Paramount Theater in Oaktown, California went with a stylized version that seems much more American. The facade of the Ejido Theater in Montevideo is covered in blocks with relief carvings, which look as though they could have come straight from the pyramids. This discovery coincided with the rise of Art Deco and came in the midst of a host of archaeological discoveries around the world. These other digs may not have yielded much in the way of gold, but they often revealed ancient art and monuments that were much less familiar then those of Egypt. All of this put modern artists in touch designs and stylings that had lain dormant for centuries. 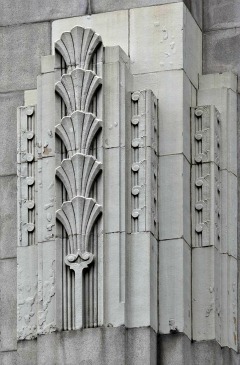 Inspiration was the result, and Art Deco became the fertile ground in which these old forms found new life. While some architects put these old designs to work much as they were, others modernized or otherwise adapted the designs to seem current. 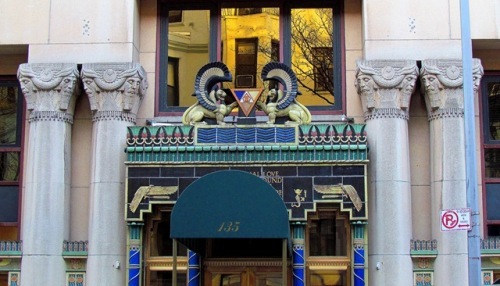 The Pythian Temple in New York City, built to house a fraternal order, has a grand entrance combining Egyptian and Babylonian art and architectural elements. The Egyptian influence continues on inside, and up top two pharaohs stand watch over the street below. Egyptian motifs were popular, but Mayan art was perhaps even more influential, at least in America. The jungles of the Yucatan were revealing abandoned cities and temples on a regular basis. Whereas most Aztec ruins were well known long before the 1920's, Mayan archaeological discoveries were fresh. Where many buildings relied on Mayan glyphs and carvings for their inspiration, others looked toward the shape of Mayan ruins. 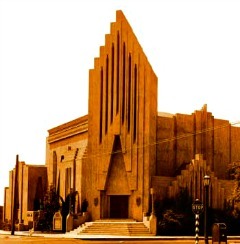 The stepped pyramids provided a strong zig-zag pattern emulated in buildings like this Church of Religious Science in Ventura, CA. 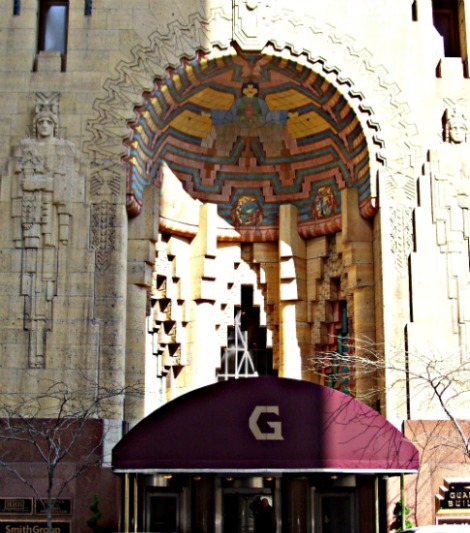 The entrance to the Guardian Building in Detroit has been heavily influenced by the zig-zags of the Mayan pyramids, but the statues and the person in the mosaic don't look much like Mayan art. They do look a little Indian. The statues are another example of the use of "guardian" statues, as noted in my page on Art Deco Gargoyles and Guardians. 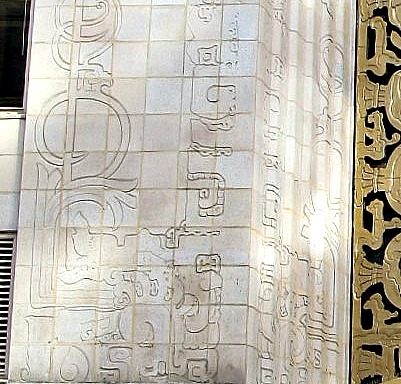 In San Francisco, at 450 Sutter Street, the building has this very interesting take on Mayan art. Or perhaps its Aztec. Lets just say its a 20th Century artists version of Meso-American art. 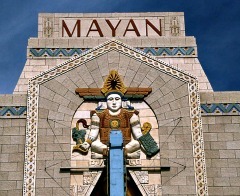 Above is another Mayan-styled theater. This was built in 1927, and themed theaters were going up everywhere. This is richly ornamented. There is so much detail that it seems too busy, but this was not unlike the Mayan ruins, which were often covered in glyphs, a form of writing. Whatever the source the architects of the day did not faint from borrowing heavily from the past, even while creating something new and different. At times the borrowing was heavy-handed, at other times the influence was barely felt. In a sense it is very strange. The architects were trying very hard to break from their Classical and Gothic pasts, but often did so by borrowing from yet another ancient tradition. I am finished adding my thoughts to this page. There are others much better versed in these things than I and I will leave it to them. In the meantime, enjoy my parting gift - the photos and captions below. 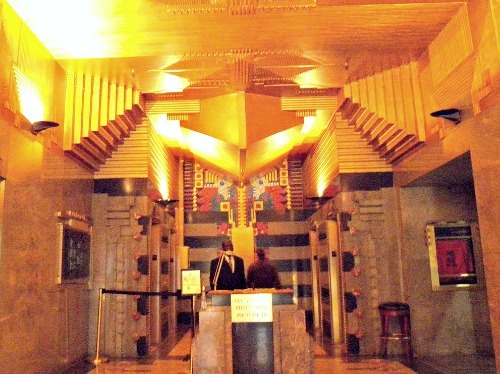 The lobby of the Film Center Building in Manhattan reveals an almost overpowering application of Mayan elements. There is no subtlety here. It hits you hard the minute you walk in the door. 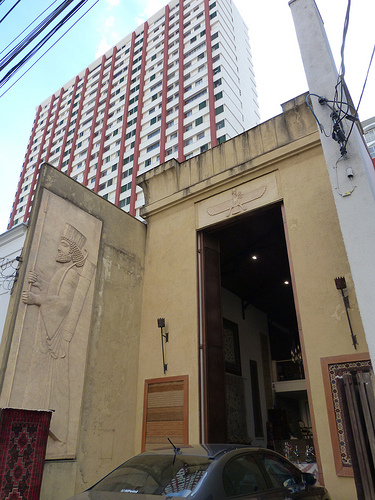 What better place for a rug merchant than a Babylonian-inspired warehouse? It may be off in time in place, but at least it seems exotic. This building is in Sao Paulo, Brazil. The two pics above show the Egyptian Papyrus plant. It wasn't always shown stacked like this, but it does create a great effect. 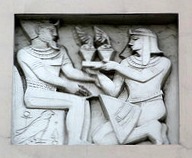 The pic on the left is stone work detail from a court house. 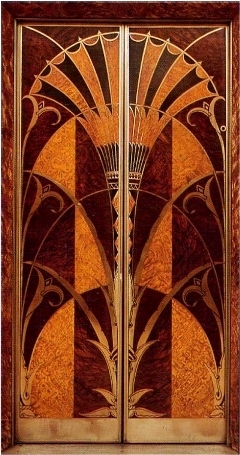 The pic on the right is of the elevator doors at the Chrysler Building. It is certainly a motif worth reviving from antiquity. Here are two pictures I took of the Leveque Tower in Columbus, Ohio. 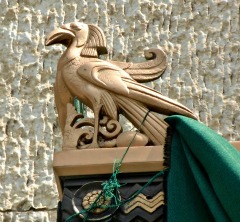 The bird sits atop a doorway and an awning covers the entryway, but had been damaged by a storm. The bird looks Egyptian to me, but don't quote me on that. The terracotta tile on the right is a westernized version of the winged sun. This symbol was used in Egypt and Assyria. In more recent times it has been borrowed by Masons, Rosicrucians, and various occultic organizations. It can represent the soul ascending to heaven.